These socks are lined with chenille to make them as warm as they possibly could be. With contrast heel and toe detail and new intarsia design they look rather good too. The origins of the classic Chelsea boot can be traced back to the Victorian era but we’ve added a few little twists to make sure they are one of the coolest styles around today. Perfect to pair with tights trousers and jeans – they’ll be the finishing touch to any outfit. As leather is a natural product there may be slight shade variations from the image photographed. Need a bit of festive cheer to start the day? 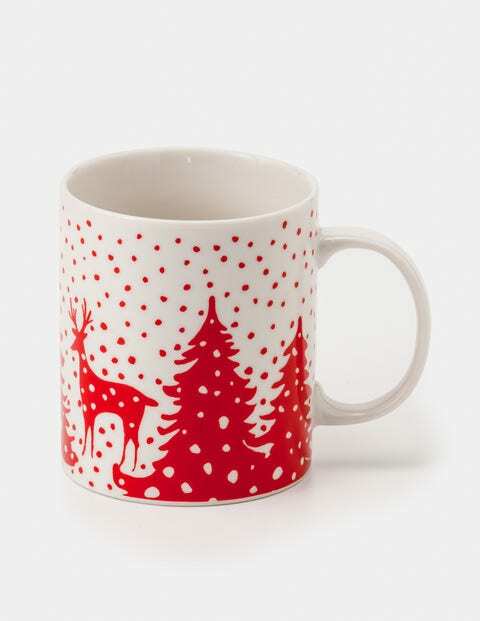 Try these lively-printed fine bone china mugs to add a touch of fun to your morning cuppa. They’re boxed to make a thoughtful present and, with a choice of five designs, everyone can pick their favourite. Girls black hybrid top in a velvet fabric over a plain white tee. Also available in pewter silver. 100% Cotton. Machine Washable. **Please note this product can only be returned by post, returns to store are not possible on this item.